In late June, the California legislature voted to ban new taxes on soda for 12 years. Reason: It was the only way to avert a beverage industry-backed ballot measure that would have made it difficult for cities and counties to raise taxes of any kind. Now, consumer activists have struck back. The California Assembly has passed the first statewide bill requiring that restaurants serve only water or unflavored milk with kids’ meals. Governor Jerry Brown is expected to sign the bill into law. While parents can still order sugary drinks like soda or juice for their children under the new regulation, restaurants can no longer serve those as the default drinks with kids’ meals. “Kids’ meals shouldn’t come with a side order of diabetes, obesity or cardiovascular disease,” said Assemblyman Kevin McCarty, D-Sacramento. Nine California jurisdictions, including San Francisco — as well as Baltimore, Louisville, and Lafayette, Colorado — have already passed healthy kids’ meal policies, according to the Center for Science in the Public Interest. In addition, New York City, Hawaii, and Vermont are considering similar bills. 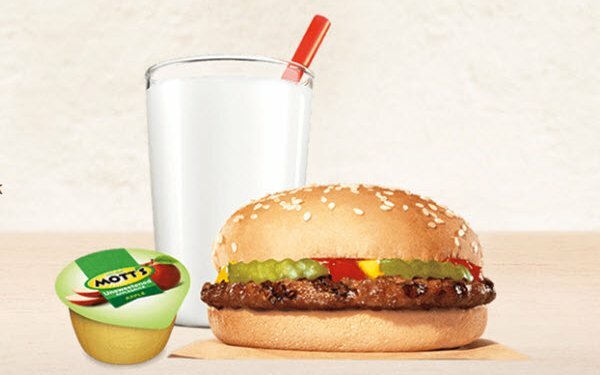 Wendy’s and Burger King (shown) dropped soda from their kids’ menus in 2015, and McDonald’s promised in 2013 not to promote soft drinks with its Happy Meals or feature them in the Happy Meals area of menu boards. However, three-quarters of the top 50 restaurant chains have not taken soda off their kids’ menus, reports CSPI.